Is it possible to have healthy chicken fried rice? Absolutely! 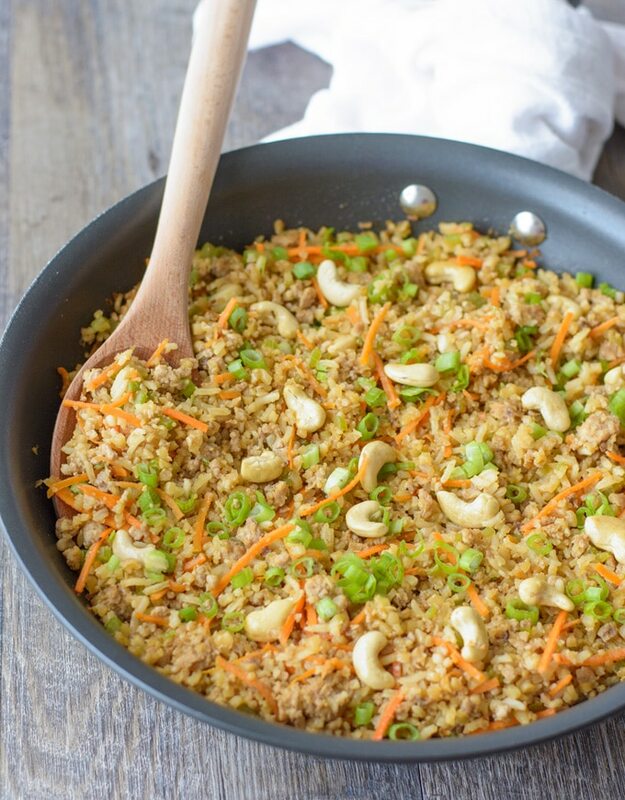 This tasty Cauliflower Chicken Fried Rice recipe is packed with veggies and lower in carbs than the usual version of this restaurant favorite! Hey guys! I want to start off by saying Texas needs your prayers right now in a major way. I’m sure you have all seen and heard about the flooding down in Houston and damage done by Hurricane Harvey on the coast. It’s bad, y’all, and it’s not even over. The good news is that as of this morning, I saw that the rain is getting lighter and slowly moving out of Houston. The bad news is that the effects will be long lasting for the people whose lives have been turned upside down. If you are able to help out, here’s a list of ways you can donate. The heartbreaking images are tough to see, but there’s another sight that gives you hope for humanity. Total strangers and neighbors helping one another flee the scary conditions of a terrible flood. Yes, it definitely gives me some hope. It’s in times like this that we could all use some good comfort food. My husband and I both love Chinese food. Can you believe he had never even tried it before we started dating? I enjoyed eating at the local Hunan restaurant when I was a young kid, so I had to take him to my favorite buffet restaurant. Fortunately, he was a fan of it, too. I’m not saying that this is in any way authentic Chinese food. This IS however really tasty! And you get to control the quality of the ingredients used. No MSG here. If you use Tamari instead of soy sauce, this is also gluten-free. I like the San-J brand of low sodium Tamari, which is certified gluten-free. Just be sure to get the low sodium kind. It’s available at Natural Grocers, Whole Foods and some conventional grocery stores. Day-old rice works best in this Cauliflower Chicken Fried Rice recipe because it’s had some time to dry out. If you forget to make it the day before, then I have a method that is almost as good. Cook the rice earlier in the day, spread it out onto a parchment paper-lined baking sheet and place into the fridge until it’s time to make dinner. 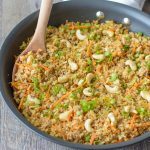 Now, I know cashews aren’t usually in chicken fried rice, but I felt that this needed a bit of a crunch. You can leave those out if you don’t like or want to use them. 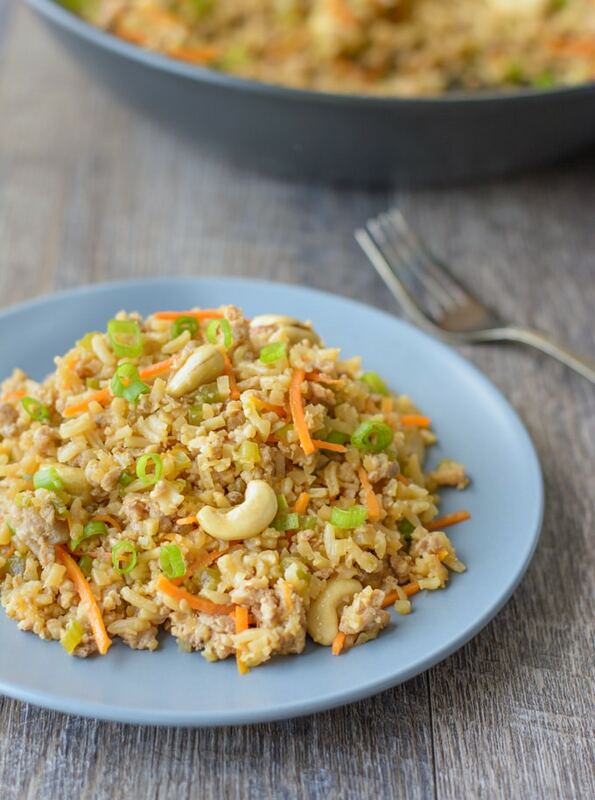 An easy and healthier version of Chicken Fried Rice. It's packed with veggies and lower in carbs than the usual restaurant favorite! In a small bowl, whisk together soy sauce, garlic, rice wine vinegar, sesame oil. Heat ghee or olive oil in a large skillet with high sides or a wok over medium-high heat. Add the ground chicken and cook until browned and cooked through, crumbling it up as it cooks. Add the celery and cook until crisp tender, about 5 minutes. Add the carrots, cauliflower and sauce to the pan and let cook, stirring frequently, until vegetables are tender, about 3-4 minutes. Stir in the rice and heat through. Add the cashews and green onions and toss to combine. Serve immediately. Day-old rice is best, but if you forget to make it a day ahead, just spread it out onto a parchment paper-lined cookie sheet and place into the fridge a few hours ahead. If using frozen riced cauliflower that can't be easily separated, you can defrost it in the microwave before adding it to the skillet. By Tempie at November 17, 2017 .